Enter the gated and esteemed San Luis Obispo Country Club estates to find this updated Spanish-style home located on the 12th fairway. 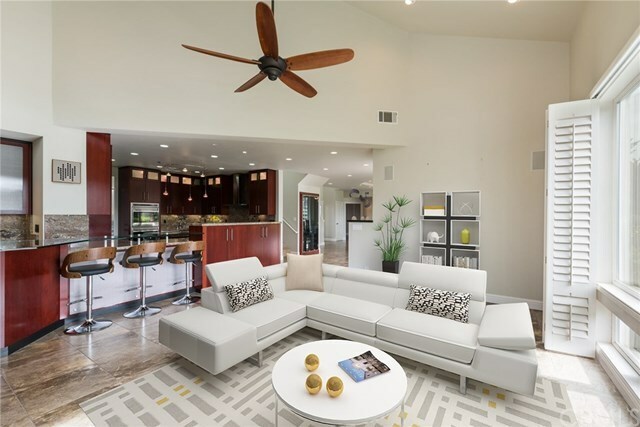 Boasting vaulted ceilings, an open floor plan layout, two master suites (one on each level), abundant guest bedrooms, a chef's dream kitchen with butler's pantry, and beautiful outdoor living spaces. The first floor features the open floor plan layout with dining area, living room with fireplace, plantation shutters and spacious kitchen with bar, island, double oven, Sub-Zero refrigerator, large walk-in pantry and two glass-enclosed wine cellars. Flowing off the entry also sits a bonus room, lower level master en suite, two guest bedrooms, guest bathroom, and spacious laundry room with built-ins and storage. Upstairs you will find the main master suite with two closets, exquisitely updated bathroom with glass-enclosed walk-in shower, soaking tub, and dual vanities. Additionally on the second level is a guest bedroom with en suite bathroom and partially covered terrace with gas fireplace sitting area overlooking the golf course and nearby rolling hills. Enjoy outdoor living all year round with the fully-equppied outdoor kitchen and BBQ, spa, patio space, grassy area, and close proximity to the SLO Country Club's clubhouse and amenities. Conveniently located in the heart of Edna Valley wine country, while only a short stroll to Los Ranchos Elementary School, quick drive to the SLO County regional airport and nearby lifestyle necessities. Directions: Enter Country Club gates, turn left on Hanover Pl and property is on the right. Inclusions: Dining room table and chairs, bar stools, outdoor BBQ kitchen, outdoor spa, water filtration system.